Above... fully painted plate, one of two auctioned at the convention to the highest bidders. 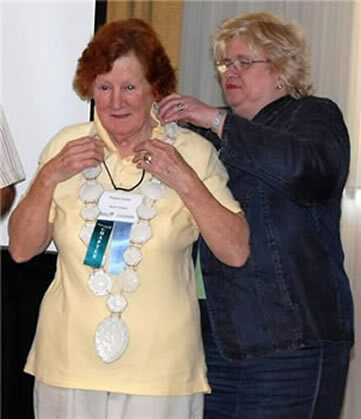 Above left..Phyllis Clarke receiving Chain of Office from Helen Rankin, honoree 2007/8 at inauguration ceremony. This was the first year that a couple became honorees. 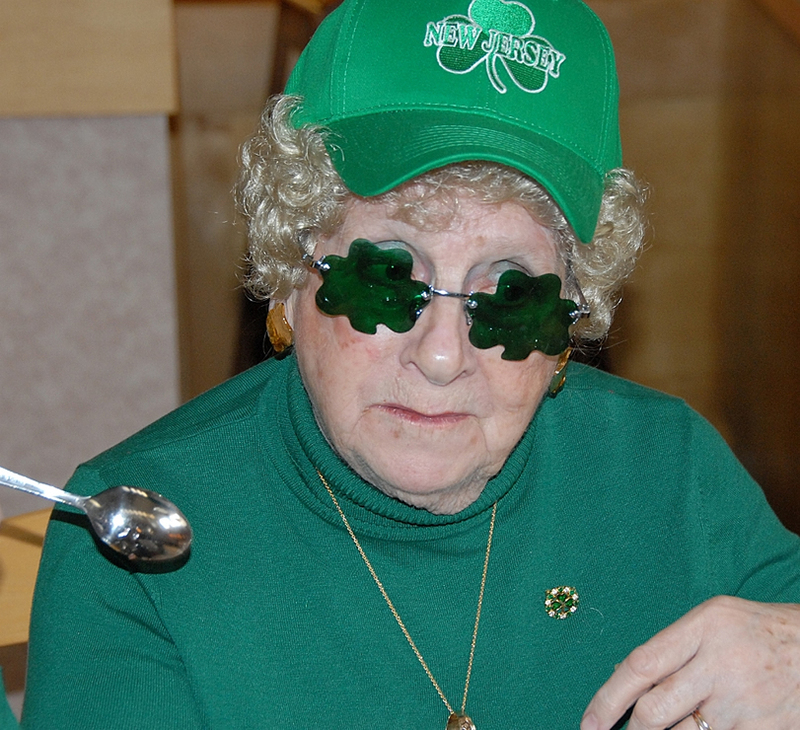 Dave Clarke, elected that Phyllis may wear the chain of office on their behalf. panelling in their period home. These are custom made to house their many trays and teapots and kettles. 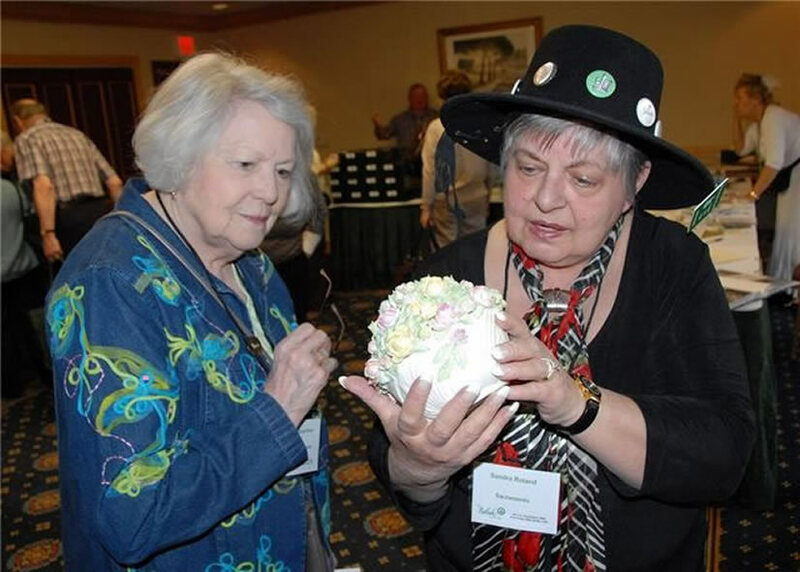 Phyllis is a teapot fancier and has a large collection from many manufacturers, she also has some American Belleek. We hope to find something nice in the dealers room at the NJ convention, as we are still avid collectors and particularly like to buy ‘pairs’. There is no question of us slowing down (well we can always put up another shelf!) and have never sold a piece. 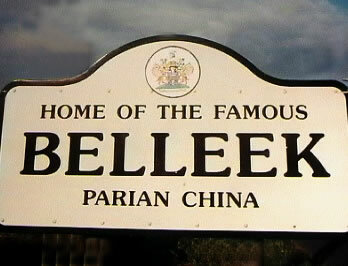 Luckily 2 of our sons are also interested in Belleek. Even though Dave came from Ireland he is definitely not a Guinness man, he used to work for Budweiser and so of course this is his favourite pint, Phyllis prefers a glass of wine'. 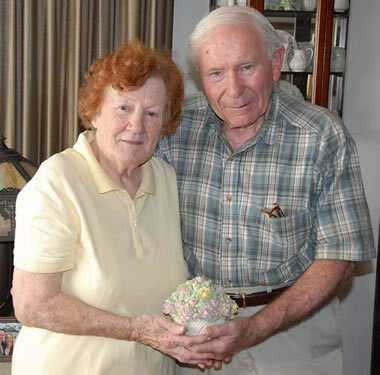 The Gala dinner at the convention was a double celebration, not only were they inaugurated as the 2009 Belleek honourees, the first time a couple have held this post, but it was also their 56th wedding anniversary. Many congratulations. 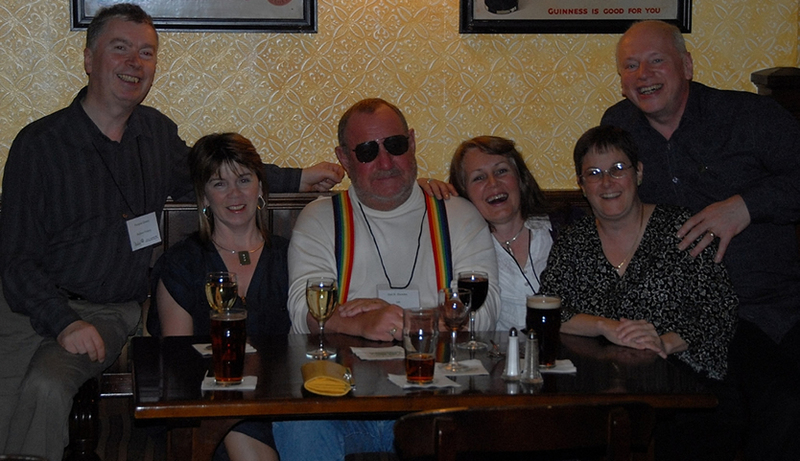 Reproduced from our Newsletter, here is Paul,Pat and Patrick Tubb's report on the 2009 convention in brief. 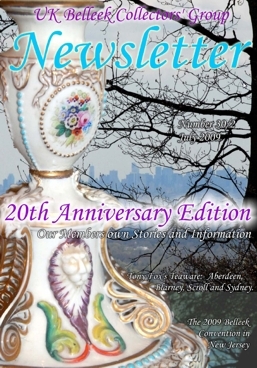 Afull version can be found and read in our Newsletter shown at foot of page. Willie Mitchell from California with their beautiful ware including two superb painted plates by Gertrude Johnson and some lovely pieces of American Belleek and, finally, Nanci Levine from Connecticut. 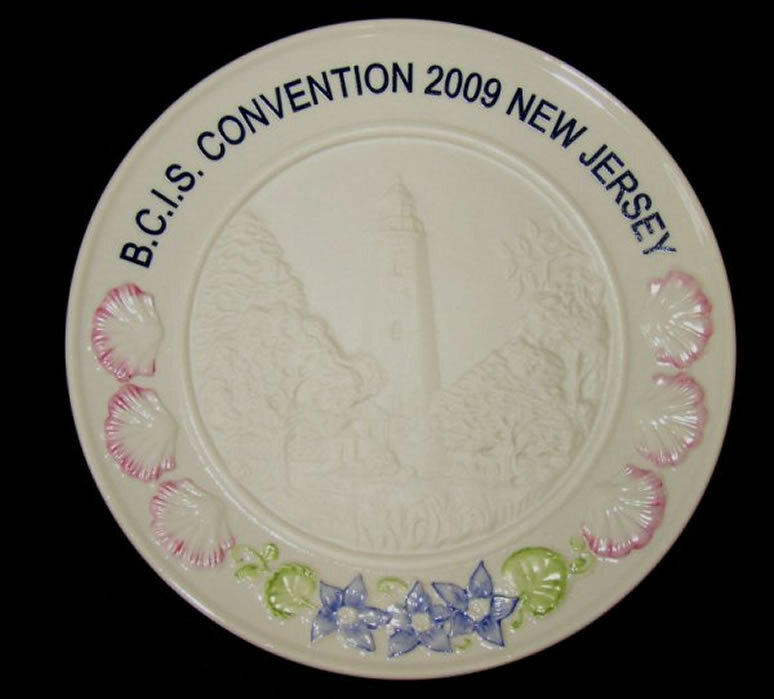 During the next few days we eventually determined to buy a decorated third period shell plate as our personal memento of the convention. 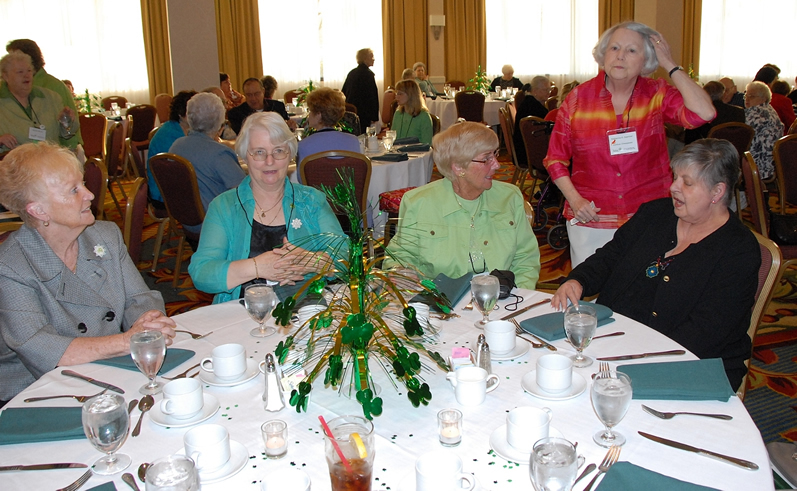 The Friday sessions began at 9.00 am under the direction of Master of Ceremonies, Don Campbell (Evergreen Chapter). The first speaker was Chris Marvell (UK Group) with an outstanding talk on the birth of Belleek which was thoroughly enjoyed by everyone and which introduced delegates to a number of new names of people involved in the formation of the great product that we love so much. Kathleen was followed by Val Fleming (Trillium Chapter) who shared her unique 'white collection' via slides and commentary. The after lunch talk was to have been given by people from the Trenton museum but due to a family bereavement they could not come so the programme was altered and Don Campbell gave us an update on his earthenware collection. He has now identified 85 different designs in earthenware, a few of which he had found in the sale rooms during this convention. The slides of his collection were magnificent but Paul, Patrick and I are delighted to have actually seen many of the pieces when Don spoke at the Portland convention in 2003. Don was followed by an interesting talk about insuring a Belleek collection from Michelle Impey a fine Art specialist. After tea and the results of the Chinese Auction (No the UK members did not win anything) came the honourees induction. 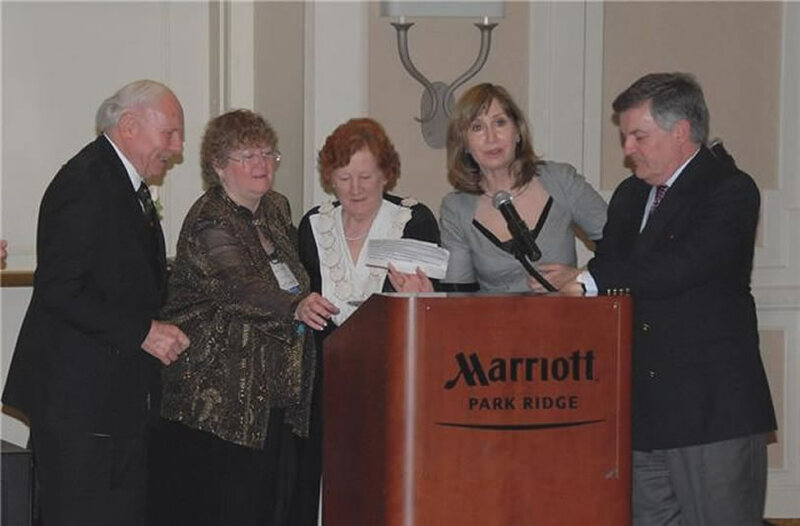 Before handing over the chain of office, Helen Rankin, 2007/8 honoree from Northern Ireland, entertained us with reminiscences of her time in office. After Angela read the citation, both Phyllis and Dave managed to get a toe on the stone from the Erne that Patricia had smuggled into the country and were duly installed as the first joint honourees after 20 single recipients. Before the evening’s Irish Night some managed time sun bathing, others did whatever attracted them and we went back to pick up Ann and Frank, Pat’s cousin and her husband, who were our guests for the evening The meal was a delicious buffet and the entertainment was provided by Seamus Kennedy who had originally come from Belfast With his constant chatter in between he kept us laughing for the whole evening. Saturday morning saw us arrive early as there was to be a meeting for Chapter presidents or their deputies at which both Chris and Paul represented our UK Group. Then, after breakfast, our first speaker was Fergus Cleary, with a slide show presentation that followed the 2009 Convention plate from inception to production. 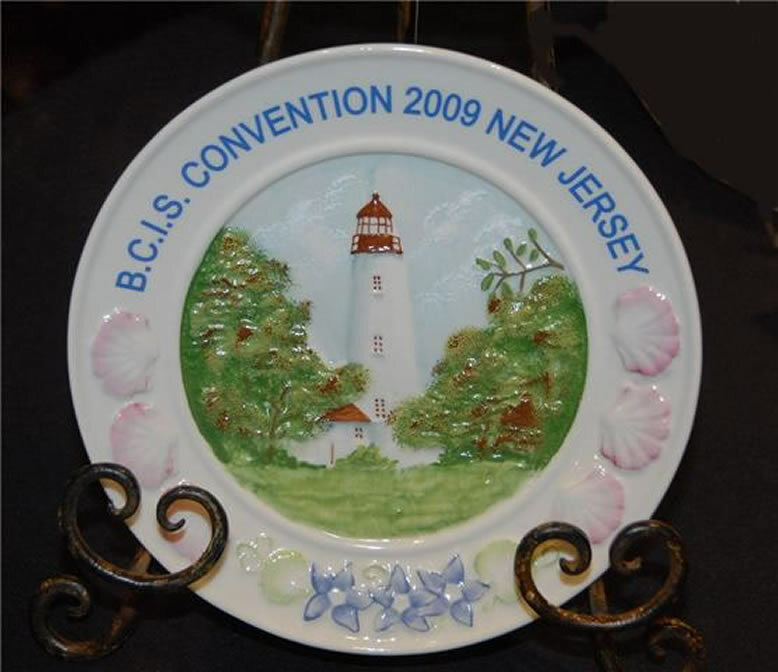 The 2009 plate was designed by Margaret Karpin (North Jersey Chapter) The post coffee session was given by a specialist member of the International Society of Appraisers whose speciality was in hand painted ceramics. It was an interesting talk on how to appraise your collection and, judging by the number of interested people who approached her afterwards, it was clearly very much appreciated. The after lunch session was a very interesting talk on American Belleek given by Mark Mohr, an enthusiastic and knowledgeable collector He showed us slides illustrating pieces from various in the Trenton area potteries and also East Liverpool Ohio that had produced American Belleek around the turn of the last century. He showed pieces painted by Nosek and had been interested to see the Willets vase on the Mitchell’s table as he had been under the impression that Nosek only painted for Lenox. At the end of his talk I showed him our pictures of pieces painted by E W Swann in the US and he was delighted to be able to keep them. Following tea Linda Beard, from the Magnolia Chapter, gave us an update on the Richard Kennedy Degenhardt Scholarship Fund of which she is the chairperson. This year, because of the recession and interest rate cuts which have affected the fund’s performance, just two bursaries, each of the usual £600 were awarded. Linda made it clear that there is an ongoing need for funds but that also the University of Ulster was most appreciative of the support it received from the BCIS membership for its students. Bagnall (Great Lakes Chapter) with Johannah Purdon, selling amongst the gathered pieces an earthenware plate. Once again, Dean did not disappoint. It is fascinating to watch him and very easy to get drawn into bidding as his patter brings everyone into the event. He managed to sell everything and two of the pieces will be winging their way back to the UK. Our purchase was a right handed Aberdeen jug) which is a perfect match for the very first piece we ever owned, a left handed one, that had been given us as a wedding present over 40 years ago. Chris and Bev Marvell bought a beautiful piece of earthenware from under Don Campbell’s nose, although he had just won the larger piece with the same decoration! The Gala Dinner took place in the grand ballroom and we all enjoyed good company, good food and good entertainment watching the dancers from the Peter Smith School of Irish Dance. Between courses George Moore spoke about the state of the pottery. It was clear from what he said how pleased and proud he is of the manner in which the Pottery is still going strong in spite of the recession. much time and effort into make everything go so smoothly, not only from North Jersey but also from the Empire Chapter. September 2011 in Chicago. This was met with great enthusiasm throughout the room. 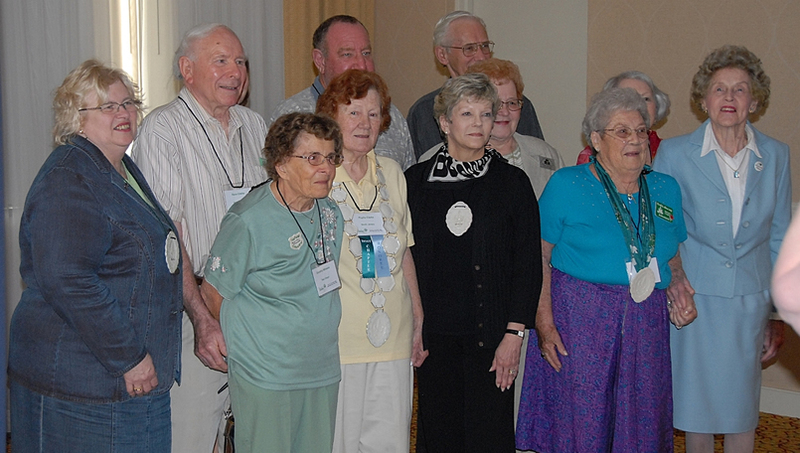 During the dancing which followed the announcement, Paul took the opportunity of using Katherine Gaertner’s phone call to pass the best wishes of the UK Group to Jean and Max Norman who had been prevented by Max’s ill health from travelling to New Jersey. Sunday morning saw us all in the junior ballroom for the concluding talks and ceremony of breaking the Convention plate mould. Jean Lockington and Johannah Purdon regaled us with some amusing anecdotes that came out of their reparations for the convention and then the attending Honourees each spoke of their memories of Belleek and Belleeking and what they had gained from their membership of the BCIS. Jean Weleck read a letter from Fred Gary, the very first honouree. 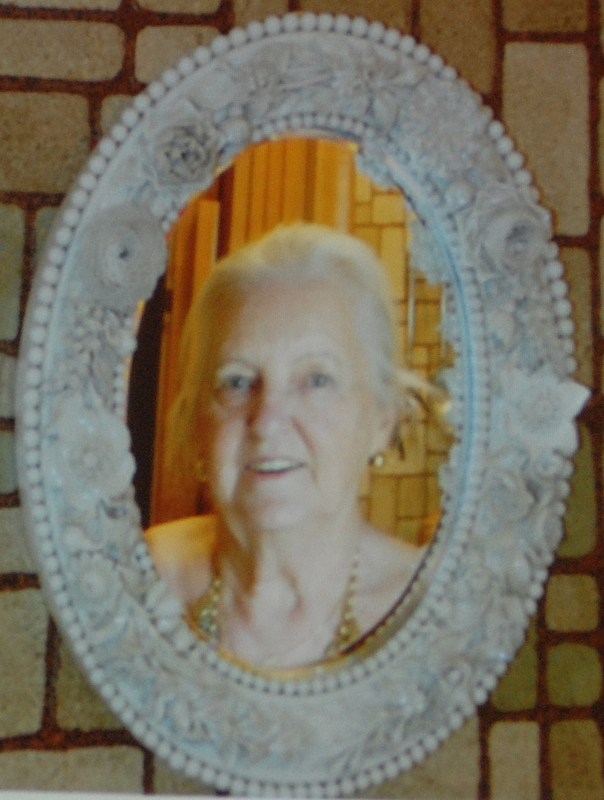 Unfortunately Evelyn Twiss, who had intended to be with us, was taken ill just before she left home to come. I was particularly sorry about this as she has always been so keen to ensure that the conventions continue. I look forward to seeing her again in Chicago. The breaking of the mould by Margaret Karpin took some doing even with Fergus and Al Purdon helping. 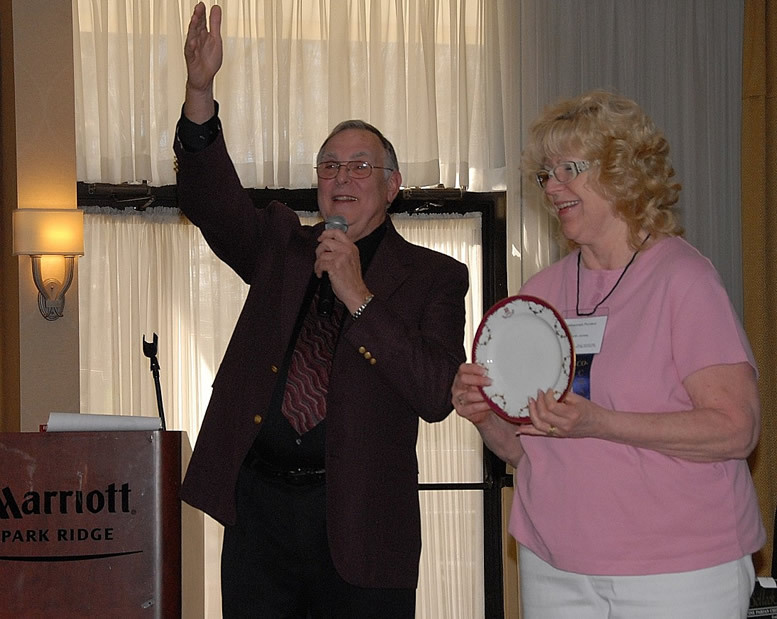 However it finally succumbed and Jean and Johannah were able to officially close the2009 Convention. As for ourselves, after many goodbyes we made our way back to my cousin’s home for a final 24 hours before returning home on a Monday evening flight. We felt a bit low but had many happy memories to sustain us and a brand new suitcase full of ‘extras’.Determined, too, that God willing we will be there for the Chicago convention in 2011. Thanks to all the North Jersey Chapter for giving us such an enjoyable convention. 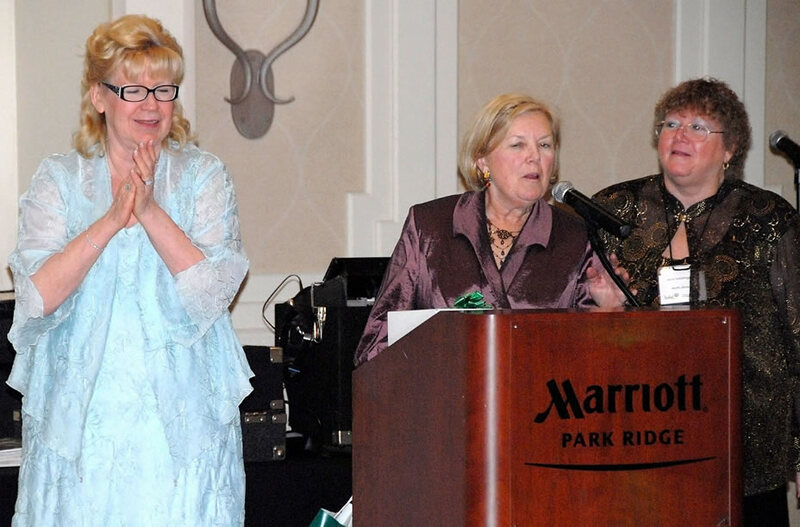 From left, Johannah Purdon, Co-President of North Jersey Chapter, Pat Hennessey, President of New York Chapter and Jean Lockington, 2009 Convention Chairperson. 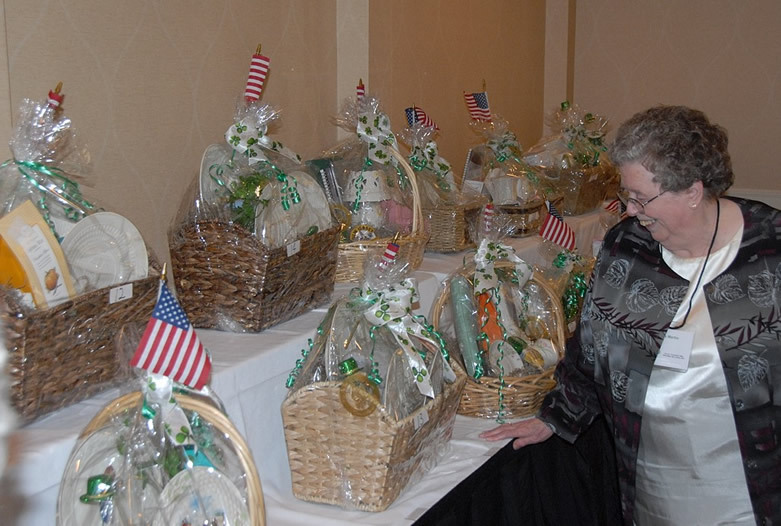 Jean and Johannah organized the convention, with other NJ chapter members helping. Pat also helped with some areas.